Finn was ousted from the only home he knows; the only safe place he’d ever seen with a tattoo of a plus on his hand… + for positive. He has no idea what waits for him on the other side, but what he finds will surprise you. Narration for Positive was done by Nick Podehl was superb. Really high quality work. The style, speed and cadence of Nick made this 15+ hour audiobook feel like 6 hours. It was one of those books I started and listened to well into the night before I realized how long I’d been listening. 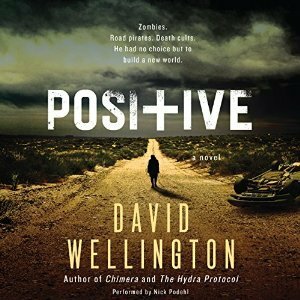 Positive was different than your typical zombie book. Don’t get me wrong, there are still blood and guts and gore and biting and all of the things you’ve grown to expect from a zombie book – but with one major change. This isn’t from the point of view of a typical survivor. It’s from the point of view of a teenage “positive” or someone who may at some point of their life come into contact with someone who has turned. They don’t know how long until someone turns, but they say that the virus can lay dormant for up to 20 years. This is your typical coming of age story, and believe me the main character really does grow up right in front of your eyes (or ears in this case). The steps that he has to take once he realizes that he is on his own really force him into growing up. There were some cheesy parts of this, but it really didn’t take away from a thoroughly enjoyable book. And to be honest, just the change in perspective (not a zombie, but not not a zombie either) was refreshing in this genre. I always enjoy when a book really surprises me; and this book did that. I’m really glad that I took the time to listen to this.